When the night bloomer blooms, all other activity for the evening comes to a halt or at least slows down enough so that I can run to the sunroom every ten minutes or so to take another picture. Excuse me, I need to go take the first picture at 7:00 pm. And I’m back. Where were we? 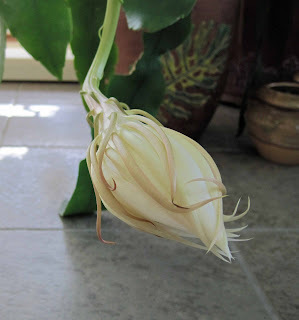 Oh yes, the night blooming cereus, Epiphyllum oxypetalum, is blooming this evening. I noticed the bud was nice and big when I got home from work and determined that this was the night. I changed all my plans to make sure I would not miss a minute of this big event. Excuse me, I need to go take another picture. This one is at 8:30 pm EDT. The night bloomer opens in a few hours beginning shortly after the dinner hour. It doesn’t open so fast that you can sit there and see it happening, but it blooms fast enough that you can see a difference at first every hour and then every fifteen minutes or so. Excuse me I need to go take another picture. This is at 8:45 pm EDT. Once it is really fully open the scent is noticeably strong. It’s exotic and heavy in the air. I’ve described it in the past as like an old lady who has lost her sense of smell and wears way too much perfume. But it is also like the scent of a child who discovers her grandmother’s old-fashioned perfumes and decides to douse herself with a little bit from each bottle. This is at 8:55 pm EDT. As it fully opens, I marvel at how white it is. It seems that every petal, stamen, pistil, sepal is almost a translucent white. It’s clean, pure, waiting for whatever pollinators fly through the night, attracted to its scent. This is at 9:08 pm EDT and nearly fully open. I know where the night bloomer grows outside it can be covered with blooms, and I’m sure that is a spectacular show to see many blooms open in one night. My night bloomer is too big and awkward to move outside in the summertime so it stays inside year around. But it still manages to bloom at least once a summer for me, if not twice. No pollinators will find it. It only blooms for me, it seems. It blooms to remind me of summer nights long ago when I watched it bloom with my Dad. It blooms to remind me that events of the garden should be celebrated and enjoyed -- that there is more to gardening than weeds, and pests, and how much rain we get or don’t get. It blooms to remind me that sometimes, fortunately, gardening is about a grand and glorious white flower that blooms in one night. By morning the flower will be faded and limp, all its energy spent. I’ll cut it off and lay it up on a shelf in the sunroom to let it dry out, next to several other dried blooms from previous summers. And I’ll begin the waiting and watching for the next bloom. 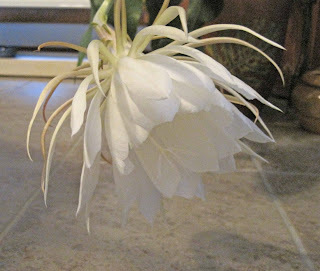 Excuse me, but here is one last picture, a close up celebrating the Queen of the Night, my night blooming cereus, Ephiphyllum oxypetalum. It's a great evening when it blooms for me. I think it's even prettier than the nutcrackers crinoline! What a special evening at May Dreams Gardens, she is beautiful. I enjoyed your descriptions and photo breaks. Awesome post! This is the right way to treat such a queen, Carol! I'd do the same thing if one lived here! Lovely, Carol. I enjoy your annual celebration of this reticent flower. What a beautiful flower. What a beautiful post. Thank you for the time-lapse photos, they are lovely. Fantastic post! The flower is beautiful. 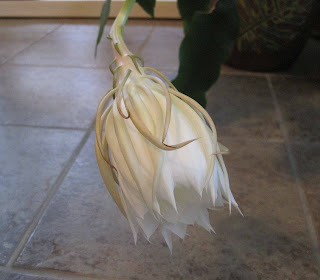 Your cereus event is like friends when theirs bloom. Lovely! So great you change plans to witness this beauty opening, as it is so ephemeral. Wow! Never heard or seen anything like it. What a fabulous show, I'd cancel everything in stay in too. Thanks for the photos, god, it is so beautiful. Things like that make you appreciate the beauty of the moment more. How poetic that she lasts only one night. I want one!!! Gorgeous! The last time mine bloomed I only realized it the next morning, what disappointment. Tomorrow is another day. Oh wow Carol, mine is just about to bloom...have four buds on it. I think in about four or five days mine will open --truly a wonderful sight!! I have mine in the garage in the winter and outside during the summer.. Outside I don't get the fragrance that you would inside. Great shots!! What a gorgeous bloom. I can feel the excitment and the smell is in the air even here. I hope you have more than one bloom to entertain you this summer. that is a gorgeous bloom. Cartwheel worthy for sure!!! Love that you have those special memories of your Father. Congratulations, Carol! 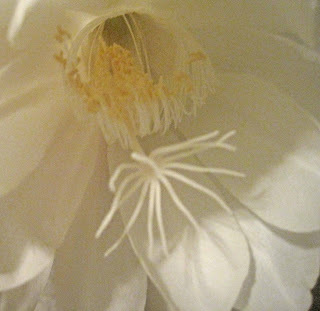 It's amazing how this bloom transforms in one night--I can see why it's such a special occasion for you. It's your own private "Bloom NIGHT." This is better than TV! Definitely worth the celebration. it is truly beautiful! one question, as it is indoors, do you pollinate it to keep the cycle going? i would guess night blooming needs large moths or bats, so what do you do? Gorgeous bloom and no wonder you have to observe it from beginning to end. Such a shame the flower doesn't last longer. Thank goodness we can capture the moment with our digital cameras. Very nice! Thanks for sharing that. Very lovely. Your flower is shaped like the one on the plant I got from my mother which hasn't bloomed yet. The one that I got from a neighbor has a flatter look than this one. Both are so gorgeous. What a great display! Mine hasn't bloomed in a number of years, and I'm still trying to figure out why it's unhappy. Hopefully one day soon I'll enjoy a similar show! Excellent visuals of the metamorphosis! so lovely! thanks for the pics ! does it have a nice fragrance? I've never seen it before, thank you for the progression shots & introducing us all to this lovely treat. I've never seen one bloom so this was a real treat. Almost felt like I was watching Disney with time lapse photos! 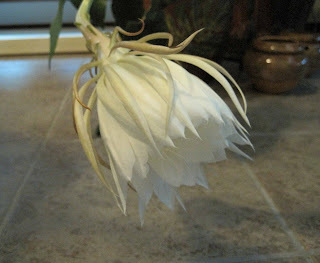 It's an event for me when my night blooming cereus blooms. I know what you mean when you say everything comes to a halt when it blooms. It stays inside during winter time and take it out to the deck in the summer. Last year I got at least 10 blooms at a time. I think one of the neatest things about gardening is the little anniversaries and rituals that attend them. So many of our modern observances began with these natural yearly events but as we've become industrialized and removed from nature our observances have become hollow. 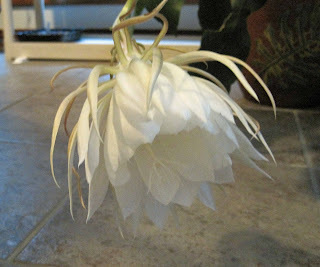 The yearly celebration of the night blooming cereus...well that has meaning. It's like your private dancer. Reminds me of a ballerina. A nice evening just for you. That is pretty special indeed. I read about these years ago and thought then that I'd love to have one. It's still one of my "someday" plants, but I sure did enjoy watching yours bloom. It's gorgeous.